© Kowalskiet al. ; Licensee Bentham Open. The discrete BFKL formalism which accounts for the running of the coupling and incorporates information about the phase of the oscillations at small transverse momentum, arising from the infrared properties of QCD, leads to a QCD pomeron consisting of a set of discrete Regge poles. Here we discuss under what circumstances this discrete pomeron leads to an amplitude which matched the prediction of a DGLAP analysis in the double leading logarithm limit. Keywords:: BFKL Equation, low-x, structure functions, pomeron, Green function. 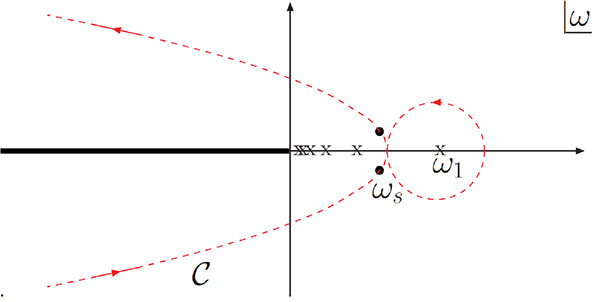 The positions of the poles ωn as well as their residues, depend not only on the infrared phases, selected by the infrared properties of QCD, but also on the precise running of the coupling. In this way, the discrete BFKL formalism acts as a communicator between high and low energy scales and the predictions of these amplitudes with large rapidity gaps are affected by physics beyond the Standard Model (BSM) even at thresholds which are considerably higher than the energies at which such amplitudes are considered. In a recent paper  we have suggested that the quality of the fit of low-x structure functions at HERA is significantly improved by the presence of a supersymmmetry threshold at around 10 TeV. There must also be a condition on the Green function for small t,(t') which is imposed by the infrared properties of QCD. For simplicity, we start with a simplified model in which the characteristic function is a quadratic function of v, i.e. The coefficint cω encodes the infrared properties of QCD and thereby determines the behaviour of the Green function for small t(t'). This has poles whenever Ø(ω)=nπ and these are the Regge poles of the BFKL pomeron. determined by the phase of the oscillatory part of the Green function at small t.
The sum generates the discrete poles of the BFKL pomeron but the analytic remainder is crucial for the matching of the t - dependence of the large rapidity-gap amplitudes to DGLAP in the DLL limit. and tc is the value of t at which vω(tc)=0. Note that this value of tc depends in the exact nature of the running of the coupling and is therefore sensitive to any thresholds for BSM physics - even for very large values of such thresholds. where ФP(t) is the impact factor that describes the coupling of the QCD pomeron to the proton and is the only process-dependent factor. 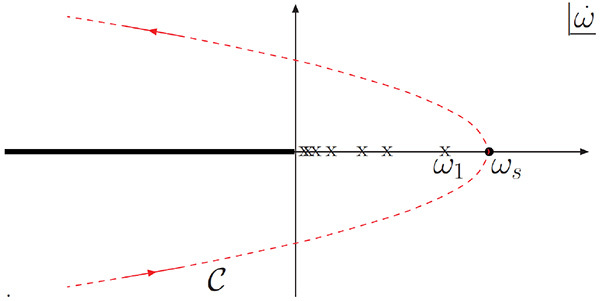 The integral over ω goes over a contour C taken to the right of all the poles of Gω (See Fig. 1). Contour for the inverse mellin transform of the scattering amplitude. Deformed contour for the inverse Mellin transform of the scattering amplitude in the case where the saddle-point, ωs lies to the right of all the poles of Gω . For sufficiently large t, this saddle-point lies to the right of all the poles of Gω (as shown in Fig. 2) i.e. For large t for which the saddle-point is given by (5), we recover the DGLAP expression on the DLL limit. The discrete poles affect the overall normalization of the unintegrated gluon density, but not its t -dependence. Deformed contour for the inverse Mellin transform of the scattering amplitude in the case where the saddle-point, ωs lies to the left of the leading pole of Gω . The contribution from the poles, which does not, in any way, match the DGLAP expression dominates at sufficiently low x. Therefore the DLL limit of DGLAP is not a good approximation in this region of t.
The infrared properties of QCD which fixes the phase of the oscillation at small t.
The precise running of the coupling including the effects of any BSM thresholds. For sufficiently large t, when the saddle-point in the inverse Mellin transform lies to the right of all the discrete poles, the t -dependence of the BFKL amplitude matched that of a DGLAP analysis in the DLL limit. 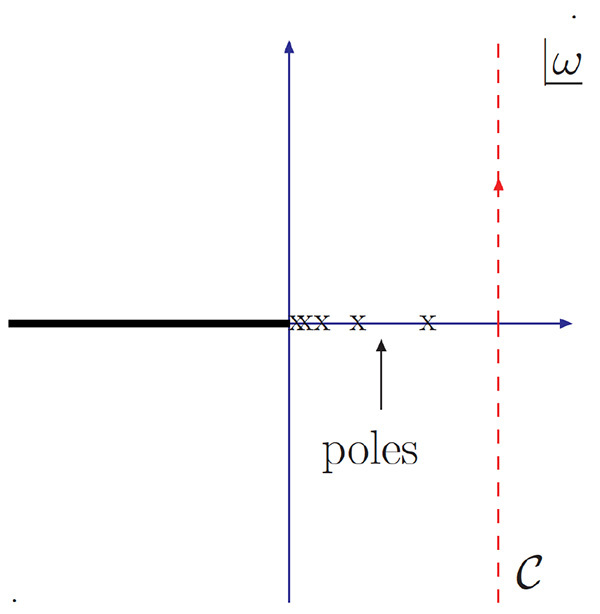 As t is reduced such that the saddle-point lies to the left of one or more of these poles, the saddle-point approximation for the BFKL amplitude must be supplemented by the contribution from the poles to the right of the saddle-point and a match to a DGLAP analysis is no longer obtained. (a) Balitsky II, Lipatov LN. The pomeranchuk singularity in quantum chromodynamics Sov J Nucl Phys 1978; 28: 822-9.; (b) Kuraev EA, Lipatov LN, Fadin VS. Multi-reggeon processes in the Yang-Mills theory Sov Phys JETP 1976; 44: 443-50.; (c) Fadin VS, Kuraev EA, Lipatov LN. On the pomeranchuk singularity in asymptotically free theories Phys Lett B 1975; 60: 50-2. Lipatov LN. The bare pomeron in quantum chromodynamics Sov Phys JETP 1986; 63: 904-12. (a) Kowalski H, Lipatov LN, Ross DA. BFKL evolution as a communicator between small and large energy scales Phys Part Nucl 2013; 44: 547-67.; (b) Kowalski H, Lipatov LN, Ross DA, Watt G. Using HERA data to determine the infrared behaviour of the BFKL amplitude Eur Phys J C 2010; 70: 983-98.; (c) Kowalski H, Lipatov LN, Ross DA, Watt G. The new HERA data and the determination of the infrared behaviour of the BFKL amplitude Nucl Phys A 2011; 854: 45-56. (a) Altarelli G, Parisi G. Asymptotic freedom in Parton Language Nucl Phys B 1977; 126: 298-331.; (b) Dokshitzer YL. Calculation of the structure functions for deep inelastic scattering and e+ e- annihilation by perturbation theory in quantum chromodynamics Sov Phys JETP 1977; 46: 641-53.; (c) Gribov VN, Lipatov LN. Deep inelastic e p in perturbation theory Scattering Sov Nucl Phys 1972; 15: 438-50. (a) Ciafaloni M, Colferai D. The BFKL Equation and next-to-leading level and beyond Phys Lett B 1999; 452: 372-8.; (b) Ciafaloni M, Colferai D, Salam DP. Renormalization group improved smaa-x equation Phys Rev D 1999; 60: 114036.; (c) Ciafaloni M, Colferai D, Salam DP, Stasto A. Expanding running coupling effects in the hard pomeron Phys Rev D 2002; 66: 054014.